Danceable tunes are generally the standard when it comes to the Scripps Ranch Symphony in the Park concert series. With a variety of bands taking the stage for the Aug. 12 show, attendees can expect to revisit dance moves from every genre and decade since rock began. The August Symphony in the Park show is unique. Instead of one or two bands, expect a showcase of Scripps Ranch talent, featuring bands Wolff, High Tide Society and Breez’n. The night will begin with the niche but nostalgic sounds of yacht rock from High Tide Society. For many, the term “yacht rock” probably doesn’t ring a bell. However, chances are these songs will hit a particularly soft spot for anybody from their mid-30s to their late 70s. “This music was so good, these hits were so big and it was played on the radio so much,” said John Perkins, High Tide Society founder and drummer. In describing the genre, Perkins was quick to cite classic acts such as Hall and Oates, Steely Dan and Kenny Loggins. While this style of music was most popular from the 1970s to the early 1980s, Perkins made it clear that we’re in the midst of a yacht rock revival. For the Scripps Ranch show, he said attendees can expect a more up-tempo approach to these generally smooth tunes to ensure danceability. For those who relish the sounds of this era, keep an eye out for the folks in the nautical outfits on Aug. 12. The sounds of the night will begin to diversify as Breez’n takes the stage, bringing in music from as far back as the 1950s. “We could play for an 80-year-old’s birthday party or we could play for an 18-year-old’s birthday party,” said band leader and founder Vince Petrucci. If the group sounds familiar, it's probably because they are. Breez’n permeated the airwaves of San Diego from 1996 to 2008, playing for San Diego’s smooth jazz station 98.1. Aside from that, they have deep roots in the Scripps Ranch community. Petrucci said not to expect anything too flashy, as members of Breez’n pride themselves on being musicians over showmen. However, he said, this does not mean attendees will have their butts glued to their seats. Highlighting the end of the show will be Wolff, a group that is bound to make the scene at Hoyt Park feel more like one from across the pond. A former resident of London, Wolff continuously cited groups such as U2, The Clash and The Kinks when describing the band’s style. When it comes to being a variety band, Wolff said he likes to keep their music choices lively and original. “We don’t feel like the world needs another ‘Sweet Home Alabama’ cover band,” Wolff said. Another group that is focused on harnessing a sense of nostalgia, Wolff said attendees can expect to hear the songs from their childhood that they once loved, but may have forgotten about. He also said that when members of the audience get up to dance, they won’t be alone. “I’m always sweating furiously no matter what the weather is,” Wolff said, describing the lively nature of the group. 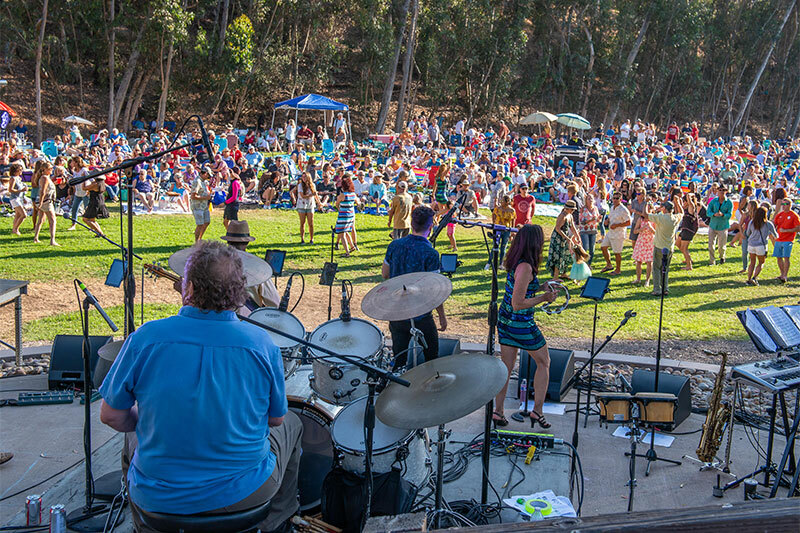 Enjoy this free ride through the genres of the decades in Hoyt Park on Sunday, Aug. 12 from 5:30 to 7:30 p.m.
Any prospective attendees of Scripps Ranch Symphony in the Park concerts should know that only low-to-the-ground beach chairs are allowed, no dogs are allowed and attendees cannot bring any plastic tarps. Visit symphonyinthepark.org.